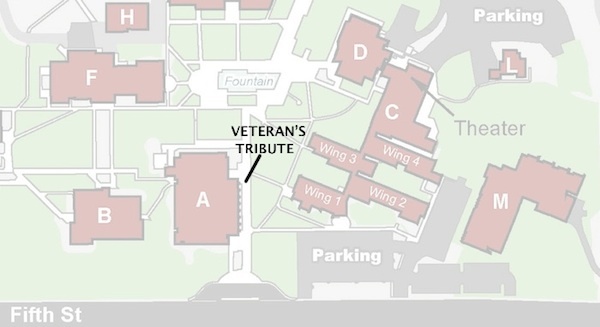 This project started as a need to create a veterans tribute on the campus of a college. 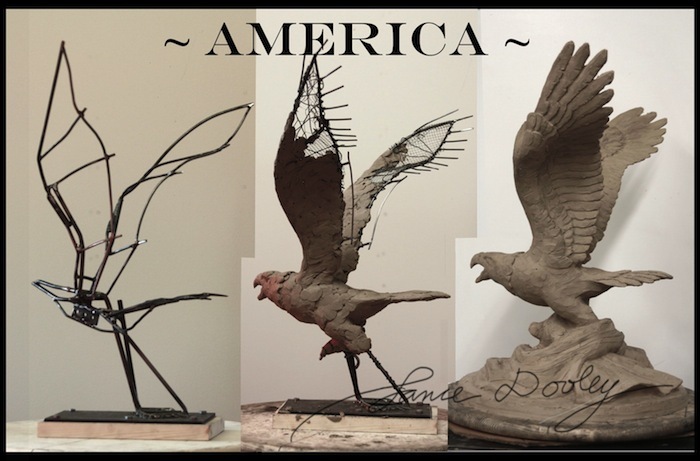 I created design drawings of a Bald Eagle with the flag of the United States of America enshrouded in the eagle's talons, because those are the two symbols that ubiquitously represent the USA. 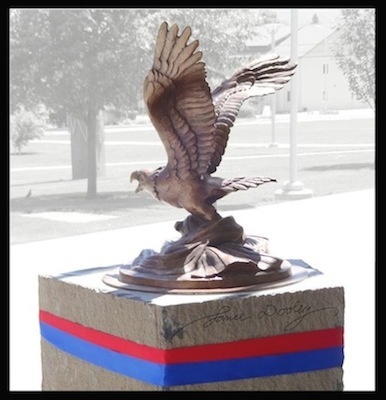 A bronze cast was placed on a basaltic pedestal on the campus of Wenatchee Valley College College on May 21, 2014. Location: Wenatchee Valley College ... right in front of Wenatchi Hall. The pedestal was installed today. 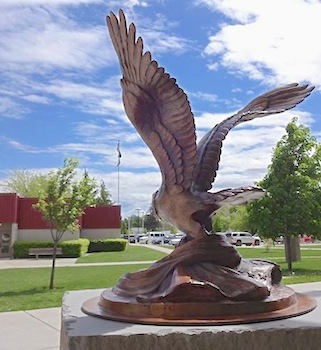 Mitchell's Rock & Landscape Supply cut the pedestal and delivered it to Wenatchee Valley College. The facilities team at WVC used a forklift to heave the 2,500 lb stone off the flatbed truck. We drilled some holes in the concrete and the bottom of the pedestal and then put a heavy coat of concrete epoxy in place, before setting the pedestal down. Only one big thud, but everything went ok and no fingers lost. 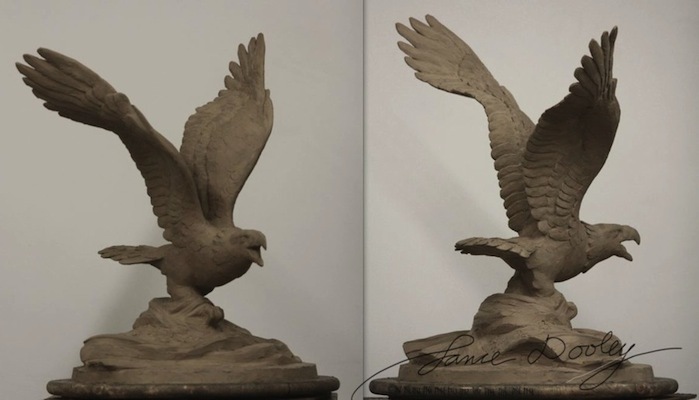 While the foundry is nearing completion of the bronze cast, I am working with a local quarry and landscaping company to get a basalt pedestal cut to size for the pedestal. 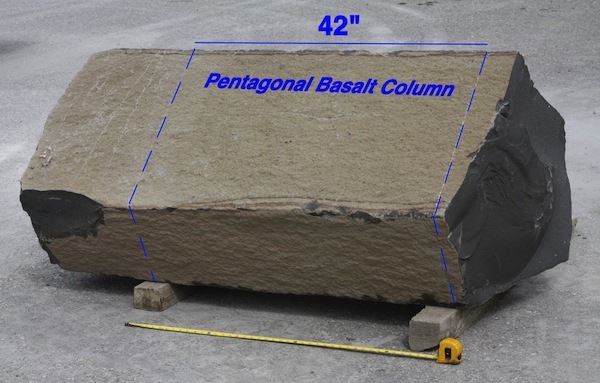 Shown here is a pentagonal basalt column that will be cut to 42" long. After the two cuts are made, a grinder will be used to make each surface as flat as possible. The mold making process is now finished. The mold has 8 segments, each segment consists of a pair (soft shell & hard shell). The mold making process has started. 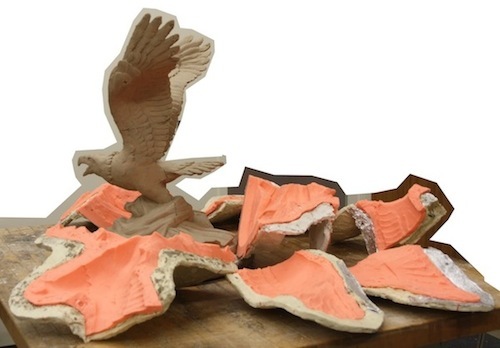 The orange material is a soft silicon that captures fingerprint quality impressions of the forms. The yellowish material is a liquid plastic that hardens to create a protective shell. These two layers work in concert to create the overall mold, which will be 8 separate pieces (each piece has a pair). The clay sculpture is now finished and I am preparing to create a mold which will capture the 3-dimensional fingerprint of all the surface forms. I will use professional grade mold making materials: Smooth-On brand Rebound 25 Silicon and Plasti-Paste. This image shows how the mold will be created in sections and the demarkation between each section: 8 sections total. Closing in on the final stages of the clay sculpture. It has been good not to rush this project and let the forms develop at a steady pace. 90% done with the clay now, just some minor touch ups here and there for optimizations. All the feathers have been delineated from each other and now strategizing on what the finished surface will look like. The stars and stripes have been etched into the clay and I am devising a way to make that information easy to see on a bronze surface that is mostly homogenous in color. The image above shows 3 snapshots at different points in time. 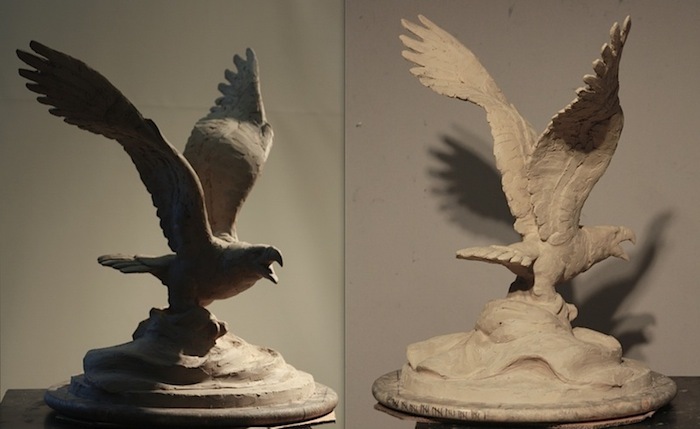 A sculptor must be a patient strategist, able to keep a vision alive over many months, but also be adaptable to changes that will help maximize the visual effect of a project. Not worrying about any details yet and still spending lots of time developing the feather patterns. Starting to subject the sculpture to various lighting conditions; multi-lap ambient, hard raking and will roll the sculpture out in the sunlight and on cloudy days if the weather warms up above freezing. 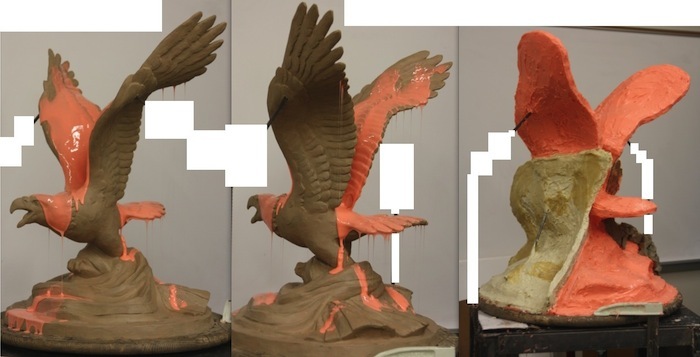 The body of the eagle, the wings, the flag and the plinth are now completely blocked in. This is a good stage to be in for critical analysis. One can stand back and properly evaluate the contour lines, gesture, volume, mass and lighting effects created by the forms. The Flag is now blocked-in. 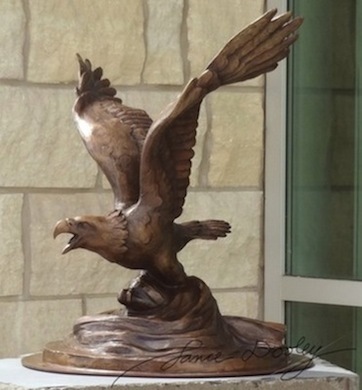 It is enshrouded around the Eagle's talons. After all minor movements are worked out, I will inscribe the stars & stripes into the clay. A little more clay was added to the wings. Styrofoam and wood were cut, shaped and put in place at the base of the sculpture so there there will be a raised section under the flag. This section of a sculpture is known as the plinth - the bottom terminus of the sculpture. So, I welded in very thin metal rods for each of the Primary Wing Feathers and bent them slightly with the torch to emulate wind force. 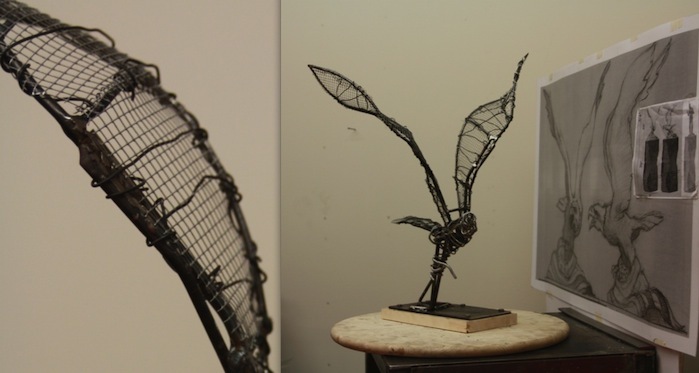 I welded in a single thin metal rod running perpendicular to near where the end of the secondary feathers will be. In case you didn't know, the primary wing feathers are counted from 1-10 towards the end of the wing. This is about 4 hours into the clay. In this stage is is only important to begin blocking-in the eagle and keep the feeling of movement and gesture. The wing panels were created by cutting patches of heavy steel mesh and weaving them into the wing struts with steel wire. Bendable aluminum wire was wrapped around various parts of the body to create some volume. Just about ready to start adding the clay. Shaped and welded some 1/16" rods to create struts in the wings. Welded some heavier 3/8" rods into the leading edge of the lower half of each wing for added strength. 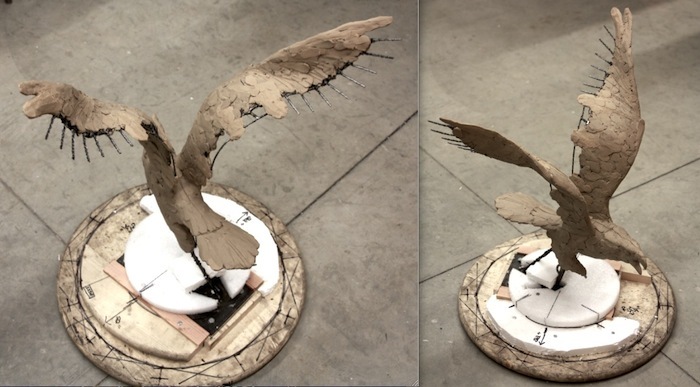 Now the wings don't wiggle around much and will be able to sustain the weight of the clay. Added 24" diameter larger project board underneath, so there is more room to manipulate the flag portion of the sculpture when the time comes. Most of the load bearing metal armature is done. 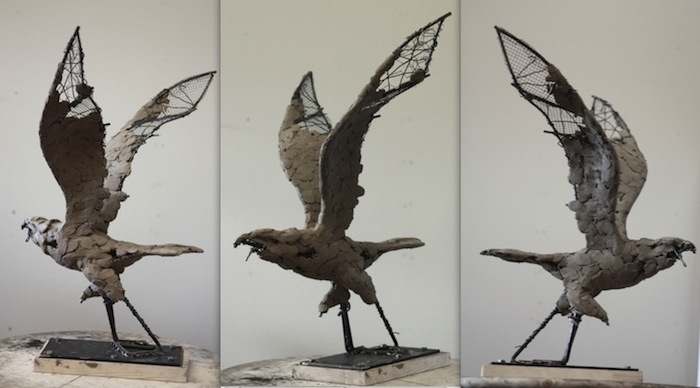 The first step in the process of building a sculpture is to create a stable and dynamic armature capable of supporting all the clay that will be added later. 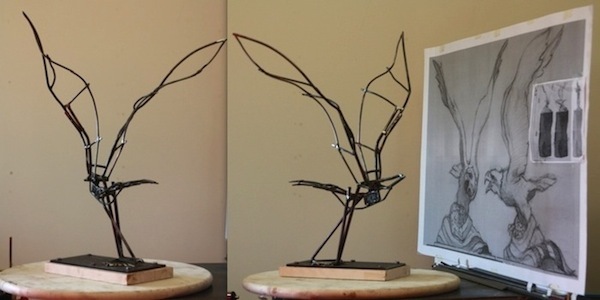 The core armature is made of mild steel rods that are welded together, bent by butane torch and welded to a section of 3/16" thick plate steel. The plate steel is drilled and screwed onto a small project board. 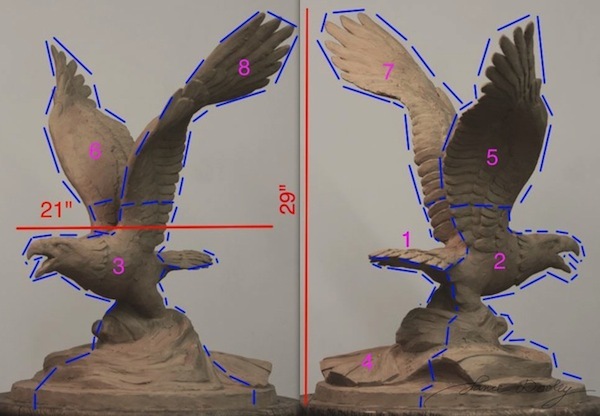 Much attention and care is emphasized on creating accurate proportions and bending the steel rods to mimmic the gesture of the eagle's wings, body and tail.